Which Brand Wins in the Indian Personal Care Industry? What does it take to generate huge amounts of engagement on social media in the personal care industry? Join me as I take a look and dissect the social strategy of one highly performing brand in the industry. Avon, Benefit Cosmetics, Clinique, Dove, Durex, Forest Essentials, Gillette, Johnson’s Baby, L’Oreal, Neutrogena, Nivea, Olay, Oriflame, Pantene, Ponds, Revlon, Sephora, The Body Shop, Wella. Does My Audience Look Big in This? Let’s begin with the basics. Often dismissed as a vanity metric and the proverbial “mine is bigger than yours” argument, I do believe that audience size has a place in social analytics. The free lunch for brands is mostly over and now social is an essential paid media channel, just like TV and print. The beauty, of course, is that unlike traditional mass media, social is far more trackable and you get immediate feedback on your campaigns. Having a bigger audience to advertise to becomes essential. Sure, there are targeting options to let you reach who you think might be interested in your product, but nothing beats an audience that has taken the time to say “Yes, I like your product”. Therefore, the larger you build your audience size, the more effective your marketing might be. The first thing that stands out to me here is just how dominant Facebook is for personal care brands in India. It’s like the other social networks don’t exist. A staggering 96% of the total personal care audience size on social media is on Facebook. Here we can see that Gillette has taken audience building to heart and gained itself over 3 million fans – the largest of any personal care brand in India. The Body Shop has been building its audience on Instagram with over 200,000 followers and L’Oreal currently has the largest following on Twitter with 86,000 followers. Right now, the growth is all about Instagram. Forget Twitter, unless you’re Durex with a 10% growth rate on that social network. 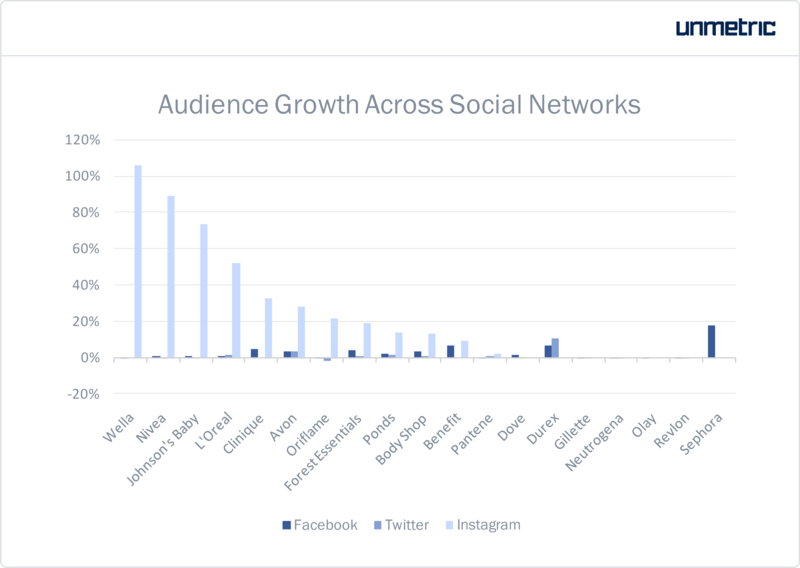 Brands are having a tough time growing their audience on Facebook, five of the brands even lost fans in the period we analyzed. It’s not a huge surprise that Instagram is posting 50-100% growth rates for some brands. When Wella doubled is follower size, we need to take into account that it started with just 2,050 followers and doubled it to 4,100. Nivea and Johnson’s Baby all had similar followings, which is why they were able to post such impressive growth. When The Body Shop is streets ahead with over 200,000 followers on Instagram, these other personal care brands have got a lot of catching up to do. Looking at the amount of content being published by a brand provides an insight into how serious social is as part of the larger marketing strategy. In the case of personal care brands in India, five brands account for 66% of the content that is published. Some brands, like Olay, Dove, Gillette and Neutrogena look like they have given up on social. They’ve published so little you wonder if it was worth the effort. Or, and social media agencies take note, it might be the case that they haven’t found the right social partner. Looking at this chart, it’s hardly a surprise that Gillette, Neutrogena, Dove and Olay saw little or even negative growth on the social channels. Their audience has got nothing to engage with and share! It is possible that these brands opted to only publish ‘dark posts’ – posts that don’t appear on the page, but are inserted directly into the newsfeed of their targeted audience. However, since there’s no audience growth for these brands, it seems unlikely. 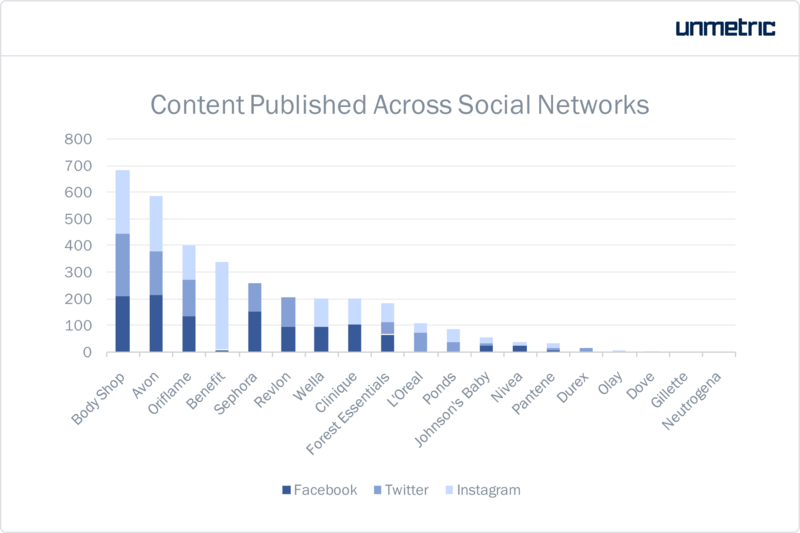 On the other hand, The Body Shop, Avon and Oriflame were taking their social media duties very seriously, publishing almost equal amounts across Facebook, Twitter and Instagram. Benefit Cosmetics appears to have seen the benefit of focusing almost entirely on Instagram as 96% of its content was published there. Publishing plenty of content is great, but only if your audience is engaging with you. Otherwise you run the risk of being yet another content polluting brand. 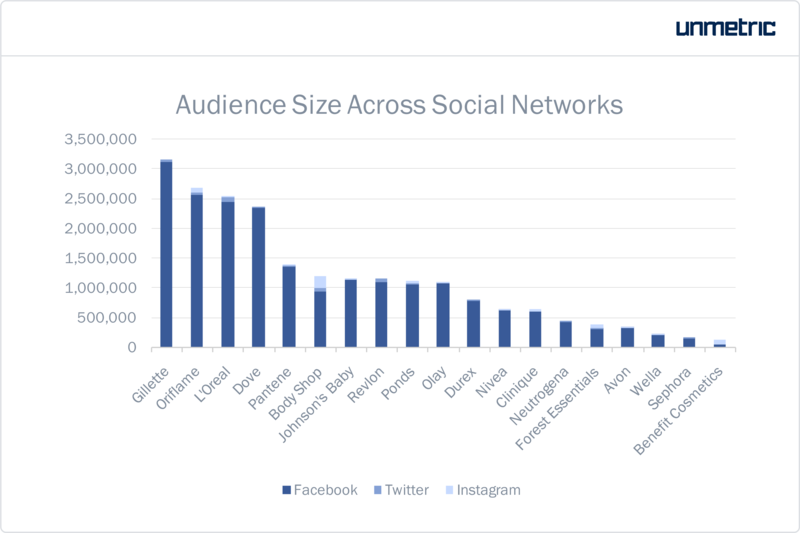 As we saw earlier, most brands have really focused on Facebook in terms of building an audience. This is great as it’s the biggest social network out there, but when Zuckerberg makes it harder and harder for these brands to reach their audience by reducing organic reach, a paid strategy is the only way forward. Oh, and if you’re thinking that Twitter is a great platform to reach your audience, think again. Just 0.6% of all user interactions happen on this social network. Dove, Neutrogena, Olay and Gillette either didn’t publish any content or published one or two posts in the period analyzed, so it’s not surprising that we don’t see much engagement here. What is surprising is to see a brand like Pantene, which published 34 pieces of content across the social networks, get almost no interaction on its content. Let’s be clear, if youryou’re social media strategy calls for you to publish content on Facebook, make sure you have a budget to go with it, otherwise you’re going to end up like all the brands to the right of Forest Essentials in the chart above. One brand that caught my eye is Durex. They published just six pieces of content in the time period analyzed, yet they generated the fourth highest engagement on Facebook. What did they do? Oh yes, that’s clever. This boosted post was the most commented post out of all the personal care brands. What about the most Liked post? Well that came courtesy of Durex as well with this boosted post. It just goes to show that it’s not about size of audience or quantity of content, it’s how you use it that counts. And Durex certainly seems to know how to make its brand’s positioning and messaging resonate with its audience. Just for completeness, the most shared piece of Facebook came from Oriflame. Generating a staggering 12,000 shares, this boosted post featuring Kalki Koechlin went straight for the heart and found its target. We’ve seen that if you’re not boosting your content on Facebook, you may as well not publish anything – it’ll have about the same reach and impact! 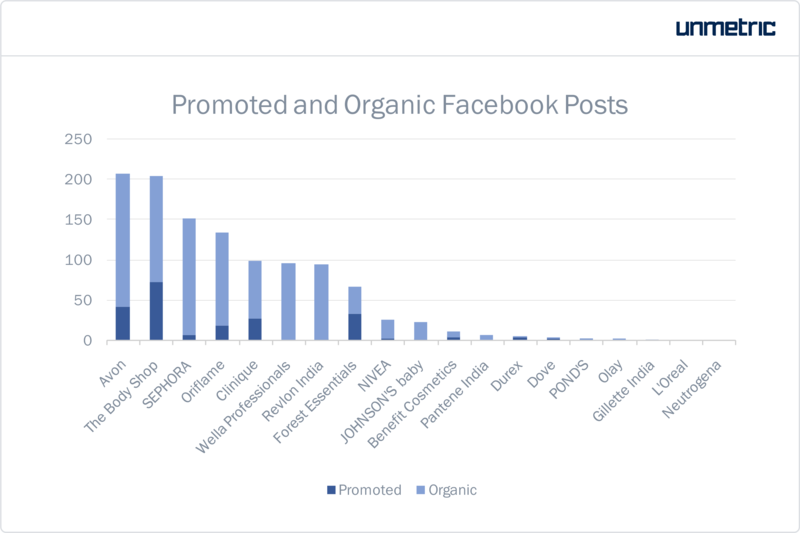 The chart below breaks down how many posts were organic and promoted. 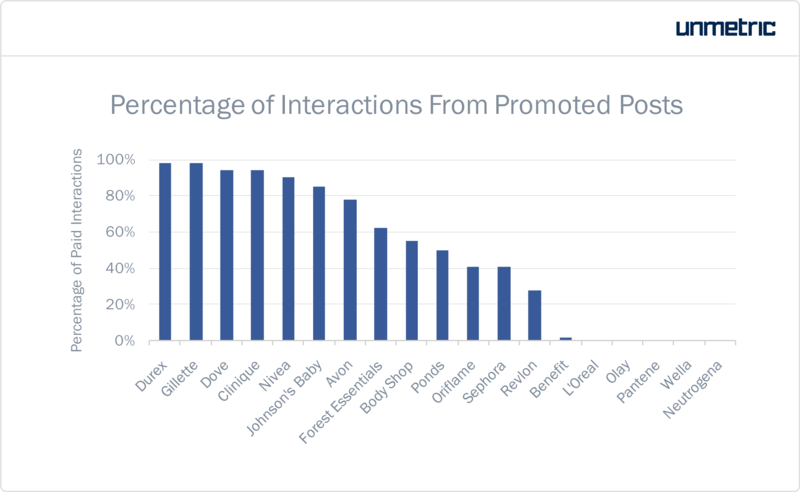 It’s not a surprise to see that Avon and The Body Shop promoted more posts on Facebook than the other brands. As we saw earlier they had one of the highest levels of user interactions which is often the result of paid promotion. A few brands like Dove, Durex and Ponds published very little content but boosted nearly every one of their posts. 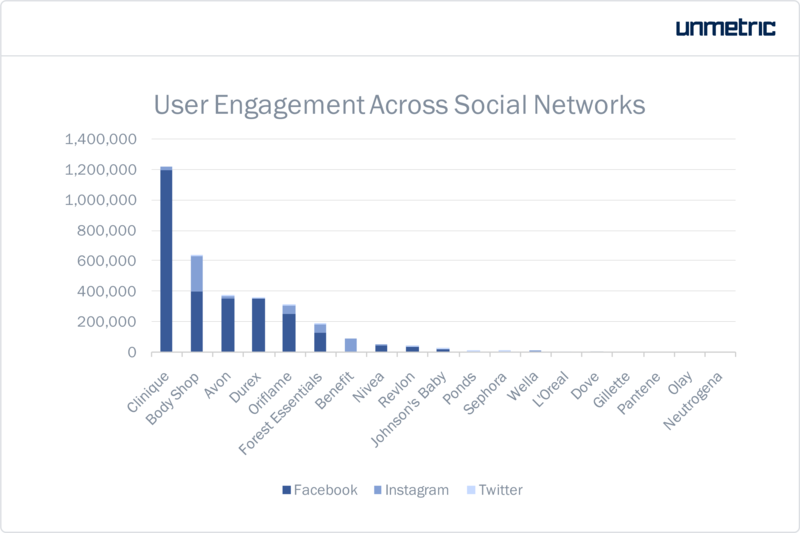 I was curious as to how Clinique got more than double the number of user interactions on its Facebook posts compared to the other brands. They are only promoting 28% of their posts, so are the interactions coming from their organic or promoted content? This chart below sheds some light on to the question. 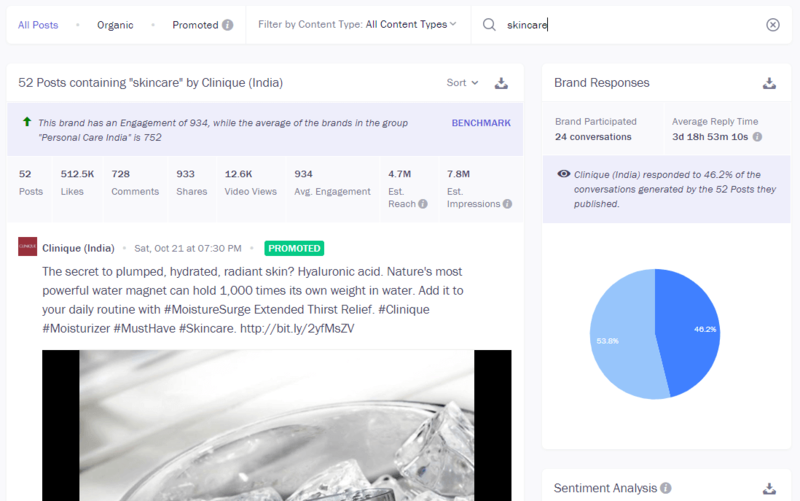 Clinique received 94% of its engagement on its promoted posts. Organic content contributed just 6% towards its 1.2 million user interactions. Durex, which generated 360,000 user interactions on its six Facebook posts, generated 98% of that engagement on its four promoted posts. The two organic posts contributed just 2% of the total user interactions Durex received in the time period analyzed. So what are is Clinique doing on social media that is so successful? They have one of the smallest audience sizes on Facebook, but their fan base is growing rapidly. They post an average amount of content, of which 28% is boosted. And yet, they are dominating the personal care industry with their interactions. Let’s dive in. 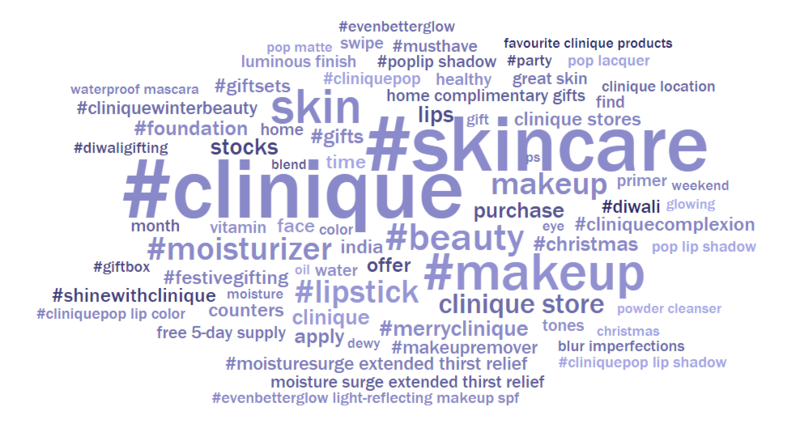 From the NLP-powered word cloud, I can see that Clinique focuses a huge amount of their time talking about skin care in combination with their brand name. The larger the text, the more often it is used. However, the darker the text colour, the more engagement the brand received on content with that text. The stand-out words here are Diwali, stocks and offer. Did they run a special Diwali based offer that fans went crazy for? Let’s find out. 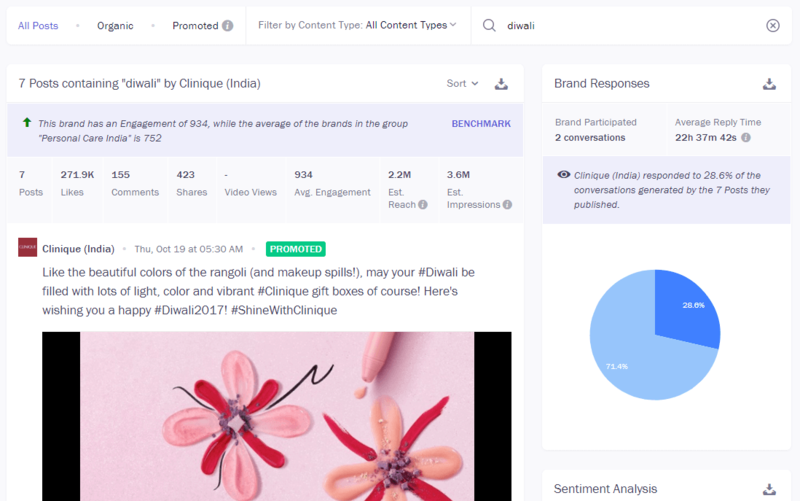 Using the individual brand post search function on Analyze, I searched for all mentions of Diwali in Clinique’s content. This gave me seven posts with over 272,000 interactions. That’s quite a lot, but only about 20% of the 1.2 million interactions. The brand must be getting a large number of interactions on other types of content. Let’s take a look at skincare. I think we’ve struck gold! 52 posts – about half the total posts by Clinique – mention skincare. This has brought in over 513,000 interactions, which is 42% of the total. Just out of curiosity, I also see lips and lipstick feature heavily in the word cloud above, so let’s try a Boolean search of: lipstick OR lips. 28 posts about lipstick or lips and that has generated 413,000 interactions for the brand – a third of the total that it received in the time period analyzed. So in a few searches, I think we’ve cracked Clinique’s successful social media strategy. Focus on skincare and the sub-categories of that, talk a lot about lipstick and top it off by talking about big events and festivals like Diwali. These are just a few personal care social media insights that we found in a couple of hours of going through a few brands. By starting with a comparison, looking for outliers and high performing brands, we found Clinique as being a stand-out. A few more clicks through its social content and we’ve effectively distilled its social media strategy on Facebook. 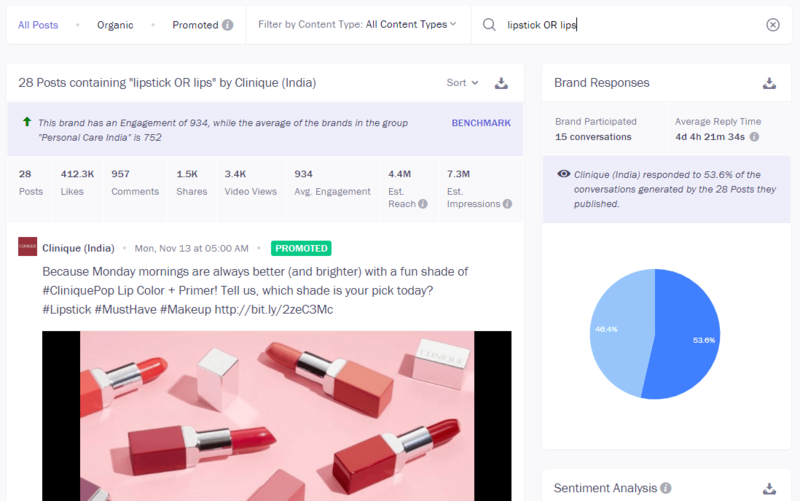 If you want to dissect what Clinique is doing on other social networks, or even do your own deep dive on one of these personal care brands, sign up for a demo today and talk to us about your competitive intelligence and social analytics requirements. ← How to win the Super Bowl on the social media front in 2019?